Call it cosmic karma, Gov. Polis was called for jury duty, on tax day. And the governor looks none too thrilled to be fulfilling his civic duty at the justice center in Boulder County. 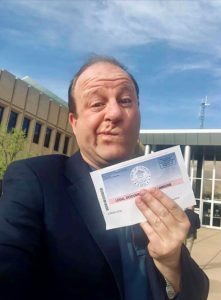 Of course he’s just feeling cute, but it’s still a sitting governor mocking jury duty, which most of us still take seriously. We seriously doubt Polis will actually serve on jury duty. The only duty’s he’s on is selfie, photo op for his twits on Twitter. But one can always hope he’ll be chosen and kept tucked away deliberating some complex case until the legislative session is over, to prevent him from signing any more tax increases and laws that infringe on our constitutional rights. That would be the ultimate Tax Day karma.